Well, we sure can pick the days for scenic trips. Fog for the TranzAlpine. Storms cut our Milford Sound trip short. The Trans Scenic was misty and overcast too. And now, we cross Queen Charlotte Sound to the north island in fog and mist. 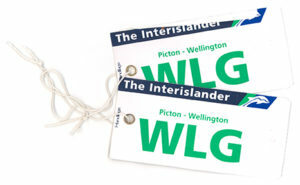 Aboard the InterIslander, we sail between the south island, where we’ve been for over a week, to the north island for a different adventure. About 1/4 of New Zealand’s population is on the entire south island. Auckland has another third, and the remaining forty-odd percent are spread out on the north island. We’re going to see a lot more people now. No more stopping in the middle of the road. It’s about three hours across the Sound. (Insert Gilligan’s Island reference here.) We stay up on deck until we can’t see the south island any more. Out in open water, the view is nonexistent and the weather conditions are wet. It’s the kind of misty rain that goes right down the back of your collar. We head below decks for the remaining two and a half hours of the trip. So much for what the Wine Spectator called “[O]ne of the most beautiful ferry rides in the world.” Our timing stinks. Speaking of bad timing, we learn that almost everyone leaves Wellington each weekend and goes home. It’s the capital of New Zealand, and basically no one lives her full-time. It’s Saturday, so we have downtown Wellington to ourselves. We explore on foot, and it’s easy to get around this stately city. There are a lot of government buildings, which is no surprise considering it’s the capital. We learn that the marble required for classical architecture was impossible to get in New Zealand in the 1800s, so these buildings are made of wood and finished to look like marble. Brilliant! The town emits a strange hybrid vibe: Edwardian buildings somehow work within Wellington’s transition to a modern city. It’s fun to explore, and easy to get around. It just feels weird without any people. There must be at least one person in town; we find a vintage Mini Cooper parked downtown. It looks like it’s had a nice life in New Zealand. And the weather is improving. Hooray! The Terrace Regency Hotel is now known as the Hotel Mercure Wellington. 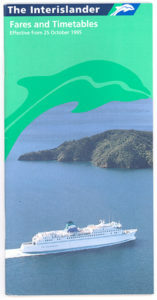 The InterIslander has wifi now. Nobody needed that in 1996. In 1987, the government in Wellington declared New Zealand a Nuclear Free Zone.